Cards: ProSet 1990, ProSet 1990 Defensive Player of the Year, Score 1989. 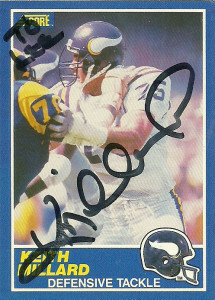 Considered one of the top defensive talents from the Pac-10 when he arrived on the pro scene in 1984 from Washington State, Keith Millard was drafted by the Vikings in the first round, but opted to sign with the USFL Jacksonville Bulls instead for the 1985 season. There in his only season he recorded 12 sacks to lead the team and its improved defense. Later that year, Keith joined the Vikings. He was listed as a nose tackle, but kicked out to defensive tackle frequently, starting 5 games, and nabbing 11 sacks alongside equally formidable defensive end Chris Doleman. In 1986, he recorded his first interception, and again hit double digits with 10.5 sacks. After the strike shortened 1987 season, Keith returned to form for Minnesota with his first All-Pro season in 1988. 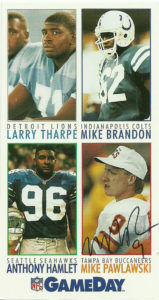 1989 was a year for the ages, as he recorded a record 18 sacks from the defensive tackle position. In addition, he had a 48 yard interception, and a fumble recovery that he rumbled, bumbled, and stumbled 31 yards with for a TD. The gargantuan year netted him NFL Defensive Player of the Year Honors for 1989. During the 4th game of the year in 1990, Keith jumped over a cut block, but tore his ACL- ending his season. The injury wore on Millard. He would not return to the field until 1992 for the Packers and Seahawks. After a brief rennaissance in 1993, playing for the Eagles, Keith decided to hang up his cleats for good. Keith is quite the accomplished veteran positional coach. He got his start with the Los Angeles Dragons of the shortlived SFL, then joined the San Fransisco Demons of the XFL in 2001. This was followed by three year stints on the Denver Broncos (2001-2004) and Oakland Raiders (2005-2008). After a brief return to the college level, Millard coached with Tampa Bay in 2011 and Tennessee in 2012. 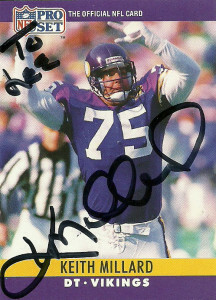 Well decorated, Millard is a member of the College Football Hall of Fame, the NFL All-1980s team, a member of the All-Time USFL Second Team, and in 2010 was named one of the Top 50 Minnesota Vikings of all time. I had been after Keith Millard for quite sometime, and it finally paid off. Millard is a solid signer actually. I just didn’t have the right luck with him. I though that I had already failed with him on two previous occasions but the records only showed one. He was kind enough to write me back on Titans stationery, thanking me for the letter, apologizing for the previous trip-ups, and enclosing an additional card. I really appreciate players who take TTM very seriously, and those who take it seriously enough that they need to ensure that their reputation remains solid with their fans. Class act! Scott Adams was another modest success story of the WLAF. At 6’5″, 275 Adams was a perfect fit for the Barcelona Dragons run oriented offense. 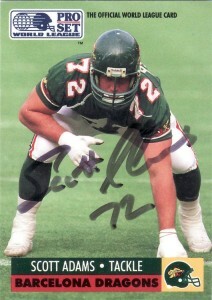 After not making the squads of the Dallas Cowboys (1989) and Atlanta Falcons (1990), Scott was drafted by the Dragons in the 3rd round of the 1991 WLAF draft. Although an impressive guard, Adams had the flexibility to also play tackle as well. He helped key the team’s drive to World Bowl I. 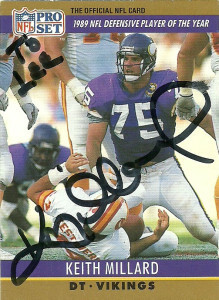 In 1992, Scott signed with the Minnesota Vikings and remained with the team through 1993. He’d then spend a series of one shot seasons with with the New Orleans Saints (1994), Chicago Bears (1995), Denver Broncos/ Tampa Bay Buccaneers (1996), and the Atlanta Falcons in 1997. After a 4 year hiatus, in 2001 Adams was drafted by the San Fransisco Demons of the XFL. He’d block up front for Mike Pawlawski and Pat Barnes, as the team made a late season charge only to lose in the Million Dollar Game against the Los Angeles Xpress. After the season the XFL folded and Adams retired back to Georgia where he eventually became an mortgage banker. Scott unexpectedly passed away on September 16th, 2013. He was just 47 and is survived by his wife and daughter.